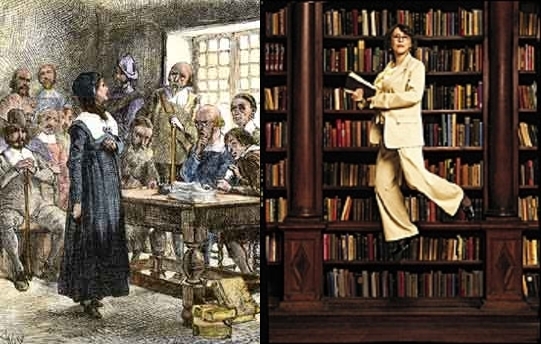 I am currently reading two books about two very different and very remarkable women. They are very different in many ways. One was born in 1955 and is alive today, the other was born in 1591 and died more than 350 years ago. One has a PhD in literature and the other was taught at home by her father and had no formal education. One had two daughters, the other 16 children. One wrote a best-selling book that won numerous literary awards and has been translated into 32 languages, the other-we have her words only as they appear in the transcript of her trial. One taught at several universities, the other taught primarily in her own home. One came to England when she was 13 and later went on to North America, the other was born in England and came to North America when she was 43. One left America to return to her native land, the other never left. One was raised in a Muslim family, the other in a Christian family. The categorization of their differences could go on and on, but the striking thing about them is not their differences but their similarities. Both had fathers who held prominent positions in society and were jailed for their religious and political statements. Both were persecuted for teaching ideas that conflicted with governmental and religious authorities. Both were forced to stop teaching by governmental and religious authorities. Both were forced to leave their homes because of governmental and religious authorities. Both were discriminated against because they were women. Both were willing to stand up for their rights in spite of the cost. Azar Nafisi was born in Iran in 1955, went to England to school when she was 13, continued her education in Norman, Oklahoma, returned to Iran in 1979, and was forced to leave Iran in 1997. There, despite their protests, the girls were kept in a small, dark room, which they shared the first night with several prostitutes and a drug addict. Their jail wardens came into their room two or three times in the middle of the night to wake up those who might have dozed off, and hurled insults at them. They were held in that room for forty-eight hours. Despite their repeated requests, they were denied the right to call their parents. Apart from brief excursions to the rest room at appointed times, they left the room twice?the first time to be led to a hospital, where they were given virginity tests by a woman gynecologist, who had her students observe the examinations. Not satisfied with her verdict, the guards took them to a private clinic for a second check. On the third day, their anxious parents in Tehran, unable to locate them, were told by the concierge at their villa that their children might have been killed in a recent car accident. They set off at once to the resort town in search of their daughters, and finally found them. The girls were then given a summary trial, forced to sign a document confessing to sins they had not committed and subjected to twenty five lashes. While Azar Nafisi was able to avoid this kind of arbitrary arrest and treatment, she was faced with a serious choice if she wished to continue teaching at Tehran University. I told the Revolutionary Committee that my integrity as a teacher and a woman was being compromised by its insistence that I wear the veil under false pretenses for a few thousand tumans a month. The issue was not so much the veil itself as freedom of choice. . . . Little did I know that I would soon be given the choice of either veiling or being jailed, flogged and perhaps killed if I disobeyed. As a result of standing up for her rights as a woman she was ultimately expelled from the university and then faced the choice, not of losing her livlihood, but of losing her life. Several years later, she and her family left their home in Iran and came to the United States where she would once again have the freedom to teach and to not wear the veil. Ironically four hundred years earlier, Anne Hutchinson and her family came to a place only four hundred miles away from where Azar teaches today. They came to a four year old village named Boston to find the religious freedom that they could not find in England. And four years later she, her family, and many of her friends would be banished from Boston for exercising that same religious freedom. They voted to banish her from the colony “as being a woman not fit for our society.” Another bit of irony was that one of those sitting on the court, had called for the women of Boston to starting wearing viels. She was put under house arrest to await her religious trial for heresy. In March 1638, the First Church in Boston conducted the religious trial. 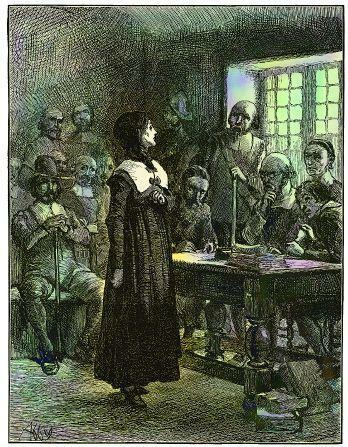 This religious court, with several members who had already judged her at the civil trial, found her guilty of heresy and voted to excommunicate her from the Puritan Church. The Hutchinsons moved to Rhode Island and helped to found the city of Portsmouth. Her husband, William, died shortly after the move. Amid rumors that the Bay Colony was going to take over Rhode Island, Anne and her children moved farther south to New Netherlands, hoping to find more freeom in the Dutch colony. But in 1643, Anne and most of her children were killed in an Indian raid. When the news of her death reached Boston, it was said by some that she had finally gotten her just reward. In 1922, a statue of Anne and her daughter was erected in front of the Boston state house. Included in the inscription are the words, “COURAGEOUS EXPONENT OF CIVIL LIBERTY AND RELIGIOUS TOLERATION.” But it was not until 1987, that Governor Michael Dukakis pardoned Anne and revoked her banishment. For those who do not see the similarities between the way these two remarkable women were abused by their society, remember that it was just 50 years after the death of Anne Hutchinson that the good people of Massachusetts began to execute women for witchcraft. For another example of the cruelty and injustice that were part of that colony read the account of the hanging of Anne’s friend, Mary Dyer.